If you have new courses that require a new course feed, contact bulletin@iu.edu and request creation of a new course feed. Create a bulletin page. Under Display Name, enter the title of the page, or how you would like it to be displayed in navigation. Enter any Keywords for the page. Some keywords will be auto-generated for your page. You may add your own keywords if desired. In the Description field, write a brief description of the page (maximum of 150 characters). Select the Yes radio button to display the page name in the left navigation. Under Bulletin Page, enter the Page Content in the text editor. 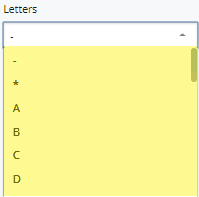 Select Letters and Levels, if desired. 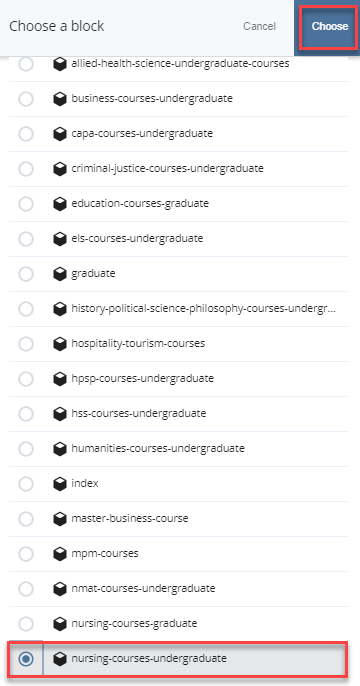 Do not change the option for Full Course List. Click into the Course Index field to select a feed block. The Choose a Block window will open. Navigate to _internal >> blocks >> _courses >> feeds. Find and select the corresponding course feed. Click Choose. The selected course feed will display. Click Save & Preview to save a draft of the page. Click Submit to display the changes.